ICNA Relief Canada has established a Janazah (funeral) Support Fund to provide financial help to needy families in an already painful situation. Funeral services can be costly and not all families are able to manage the necessary expenses when a loved one dies. ICNA Relief is currently compiling resources to help guide Muslim families to appropriate Islamic Funeral Services, in addition to helping alleviate the financial burden incurred. "A Muslim has five rights upon other Muslims: responding to his Salam, answering his invitation (to food), making Tashmeet when he sneezes, visiting him when he is sick, and following his Janazah when he dies." 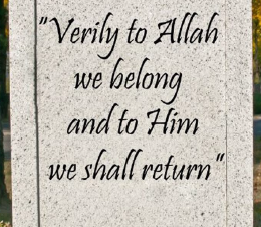 Please donate generously to the ICNA Relief Canada Funeral Support Fund and help preserve the dignity of our Muslim brothers and sisters in their journey to the hereafter. This service is currently available only in the Greater Toronto Area, but we hope to expand it to other cities soon, Insha’Allah.